ADVENTURE!! TOYOTA CERTIFIED!! 7YEAR/100K MILE WARRANTY!! 3.9% X 60 MONTHS!! AWD!! ONLY 617 MILES!! 8 INCH COLOR TOUCH SCREEN!! SUNROOF!! APPLE CARPLAY!! 19 INCH BLACK ACCENTED RIMS!! POWER LIFTGATE!! TOYOTA SAFETY SENSE 2.0!! DYNAMIC RADAR CRUISE CONTROL!! 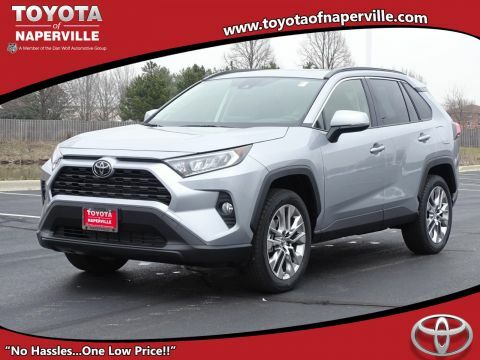 2019 TOYOTA RAV4 ADVENTURE AWD, RUBY FLARE PEARL ON BLACK HEATED/COOLED SOFTEX SEATING, 2.5L 4-CYL ENGINE UNDER THE HOOD, 8-SPD AUTOMATIC TRANSMISSION, LETS GO OVER ALL THE OPTIONS ON THIS REDESIGNED RAV4!! ENTUNE 3.0 WITH 8 INCH COLOR TOUCH SCREEN!! POWER GLASS SUNROOF, 6-SPEAKER PREMIUM SOUND, BLUETOOTH FOR PHONE, USB MEDIA PORT, 4 USB CHARGING PORTS, SIRI EYES FREE, APPLE CARPLAY TECHNOLOGY, SMART KEY SYSTEM WITH PUSH BUTTON START, POWER DRIVERS SEAT, DUAL ZONE CLIMATE CONTROL, MATTE BLACK ACCENTED 9 INCH RIMS, LED HEADLIGHTS, INTEGRATED FRONT FOG LAMPS, UNIQUE ADVENTURE GRADE ROOF RAILS, POWER LIFTGATE, NOW…LETS TALK SAFETY!! TOYOTA SAFETY SENSE 2.0 INCLUDES: PRE-COLLISION SYSTEM WITH PEDESTRIAN DETECTION, FULL-SPEED RANGE DYNAMIC RADAR CRUISE CONTROL, LANE DEPARTURE ALERT WITH STEERING ASSIST, LANE TRACING ASSIST, AUTOMATIC HIGH BEAMS, BRAKE ASSIST AND SMART STOP TECHNOLOGY, 8 AIRBAGS, BLIND SPOT MONITOR WITH REAR CROSS TRAFFIC ALERT, AND DOWNHILL ASSIST CONTROL, BUT WAIT RAV4 SHOPPERS…WE STILL HAVE WARRANTY TO COVER!! 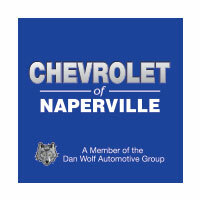 YOU GET A FULL 36 MONTH OR 36,000 MILE BUMPER TO BUMPER COVERAGE GOOD UNTIL 03/16/2022 OR 36,000 MILES, PLUS A 7 YEAR OR 100,000 MILE POWERTRAIN COVERAGE, AND FOR THE CHERRY ON TOP…2 YEARS OR 25,000 MILES OF SCHEDULED MAINTENANCE GOOD UNTIL 3/16/2021 OR 25,000 MILES AT NO ADDITIONAL COST TO YOU!! 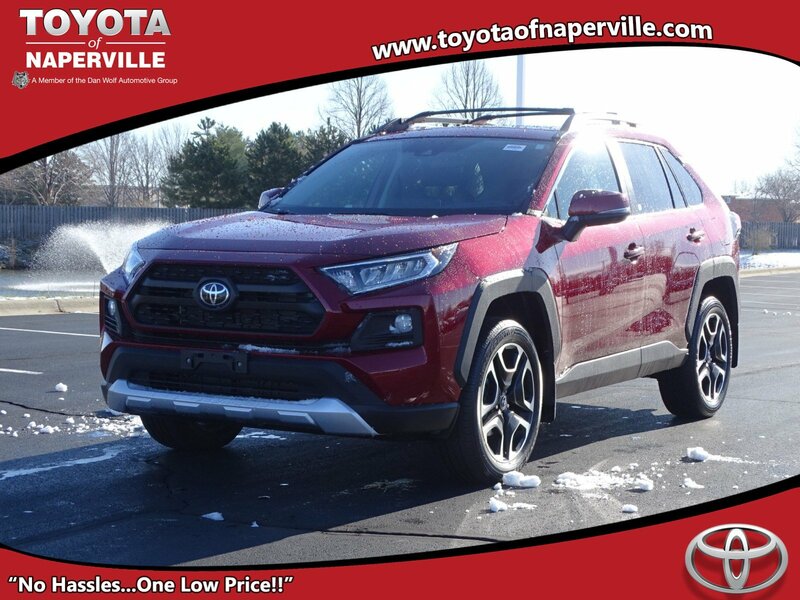 ONLY THING LEFT TO DO IS COME ON DOWN TO TOYOTA OF NAPERVILLE AND TAKE THIS LOADED UP RAV4 FOR A SPIN AROUND OUR WORLD FAMOUS TOYOTA OF NAPERVILLE TEST TRACK!! FIRST ONE HERE WINS…SEE YA SOON…LET’S GO PLACES!! ADVENTURE!! TOYOTA CERTIFIED!! 7YEAR/100K MILE WARRANTY!! 3.9% X 60 MONTHS!! AWD!! ONLY 617 MILES!! 8 INCH COLOR TOUCH SCREEN!! SUNROOF!! APPLE CARPLAY!! 19 INCH BLACK ACCENTED RIMS!! POWER LIFTGATE!! TOYOTA SAFETY SENSE 2.0!! DYNAMIC RADAR CRUISE CONTROL!! 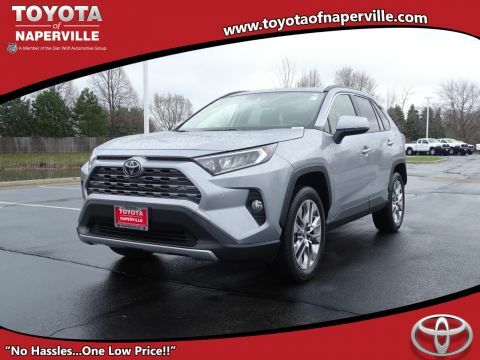 2019 TOYOTA RAV4 ADVENTURE AWD, RUBY FLARE PEARL ON BLACK HEATED/COOLED SOFTEX SEATING, 2.5L 4-CYL ENGINE UNDER THE HOOD, 8-SPD AUTOMATIC TRANSMISSION, LETS GO OVER ALL THE OPTIONS ON THIS REDESIGNED RAV4!! ENTUNE 3.0 WITH 8 INCH COLOR TOUCH SCREEN!! POWER GLASS SUNROOF, 6-SPEAKER PREMIUM SOUND, BLUETOOTH FOR PHONE, USB MEDIA PORT, 4 USB CHARGING PORTS, SIRI EYES FREE, APPLE CARPLAY TECHNOLOGY, SMART KEY SYSTEM WITH PUSH BUTTON START, POWER DRIVERS SEAT, DUAL ZONE CLIMATE CONTROL, MATTE BLACK ACCENTED 9 INCH RIMS, LED HEADLIGHTS, INTEGRATED FRONT FOG LAMPS, UNIQUE ADVENTURE GRADE ROOF RAILS, POWER LIFTGATE, NOW...LETS TALK SAFETY!! TOYOTA SAFETY SENSE 2.0 INCLUDES: PRE-COLLISION SYSTEM WITH PEDESTRIAN DETECTION, FULL-SPEED RANGE DYNAMIC RADAR CRUISE CONTROL, LANE DEPARTURE ALERT WITH STEERING ASSIST, LANE TRACING ASSIST, AUTOMATIC HIGH BEAMS, BRAKE ASSIST AND SMART STOP TECHNOLOGY, 8 AIRBAGS, BLIND SPOT MONITOR WITH REAR CROSS TRAFFIC ALERT, AND DOWNHILL ASSIST CONTROL, BUT WAIT RAV4 SHOPPERS...WE STILL HAVE WARRANTY TO COVER!! YOU GET A FULL 36 MONTH OR 36,000 MILE BUMPER TO BUMPER COVERAGE GOOD UNTIL 03/16/2022 OR 36,000 MILES, PLUS A 7 YEAR OR 100,000 MILE POWERTRAIN COVERAGE, AND FOR THE CHERRY ON TOP...2 YEARS OR 25,000 MILES OF SCHEDULED MAINTENANCE GOOD UNTIL 3/16/2021 OR 25,000 MILES AT NO ADDITIONAL COST TO YOU!! ONLY THING LEFT TO DO IS COME ON DOWN TO TOYOTA OF NAPERVILLE AND TAKE THIS LOADED UP RAV4 FOR A SPIN AROUND OUR WORLD FAMOUS TOYOTA OF NAPERVILLE TEST TRACK!! FIRST ONE HERE WINS...SEE YA SOON...LET'S GO PLACES! !